From #1 bestseller Michael Connelly's first career as a prizewinning crime reporter—the gripping, true stories that inspired and informed his novels. 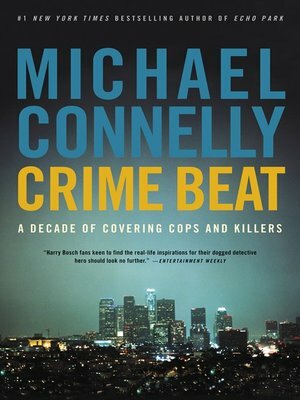 Before he became a novelist, Michael Connelly was a crime reporter, covering the detectives who worked the homicide beat in Florida and Los Angeles. In vivid, hard-hitting articles, Connelly leads the reader past the yellow police tape as he follows the investigators, the victims, their families and friends—and, of course, the killers—to tell the real stories of murder and its aftermath. Connelly's firsthand observations would lend inspiration to his novels, from The Black Echo, which was drawn from a real-life bank heist, to Trunk Music, based on an unsolved case of a man found in the trunk of his Rolls Royce. And the vital details of his best-known characters, both heroes and villains, would be drawn from the cops and killers he reported on: from loner detective Harry Bosch to the manipulative serial killer the Poet. Stranger than fiction and every bit as gripping, these pieces show once again that Michael Connelly is not only a master of his craft, but also one of the great American writers in any form.